Difficulty: 5 out of 10 This really depends on your skill level, since you are putting a V8 in a Ranger you must at least think you have some level of skill turning a wrench. Really nothing that technical just stacking on the right parts in the right order. Time to install: Probably a day or two. This is hard to estimate because of the head scratching involved in doing this the first time. How to put a 1996-2001 5.0 Explorer Front Engine Accessory Drive onto a non Explorer engine in an 83 to late 1980’s RBV. Parts listed below are for 1996-2001 5.0 Explorer, part number below are for reference using common major brands, different brands with different pricing are available depending on your location. I tried to use common numbers so you could go to just about any parts store website and get a picture of what you need. 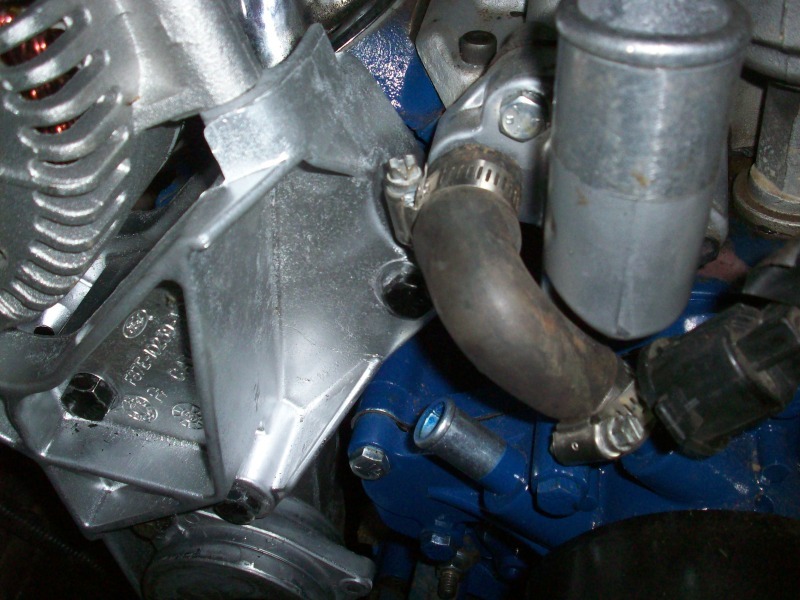 Both aluminum brackets with hardware for PS pump, alternator tensioners/idlers and A/C compressor if applicable. 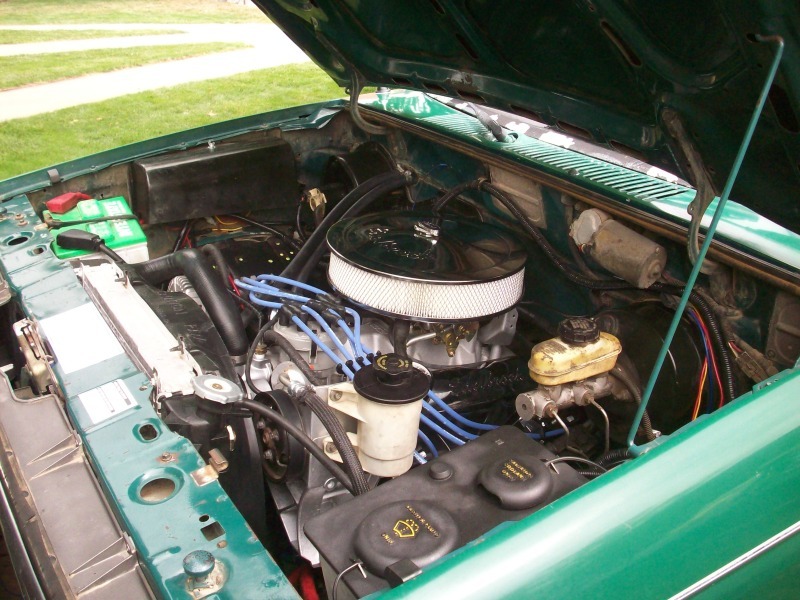 Optional is an engine driven fan vs. an electric fan like a lot of swaps. You can run a wide variety of fans depending on what you did with your radiator and frankly how dumb lucky you are. The main advantages to swapping a 5.0 Explorer FEAD (Front Engine Accessory Drive) onto your older engine is to get easy to service modern accessory drive components (130A alternator) and a Saginaw power steering pump that is vastly superior to the standard issue whiner Ford pump with a plastic reservoir mounted on it… and to top it off it is all the shortest FEAD Ford ever hung on their small block V8. Both the alternator and PS pump bolt on with no hard to get at hardware or long pivot bolts. They are mounted high so you won’t have to dig deep into the bowels of your truck in the middle of nowhere to service them plus there are enough 5.0 Explorers and others that use them to keep parts in stock across the country. It isn’t perfect but for a short high performance OEM quality FEAD it is a pretty good choice IMO. It is pretty much a bolt in for the ‘98+ Rangers but as you go farther back in the RBV timeline things complicate a little. This is what I bumped into converting the 1987 Crown Victoria 5.0 to the FEAD out of a 1997 Ford Explorer with the 5.0. There are a wide variety of engines and trucks out there so things can vary. 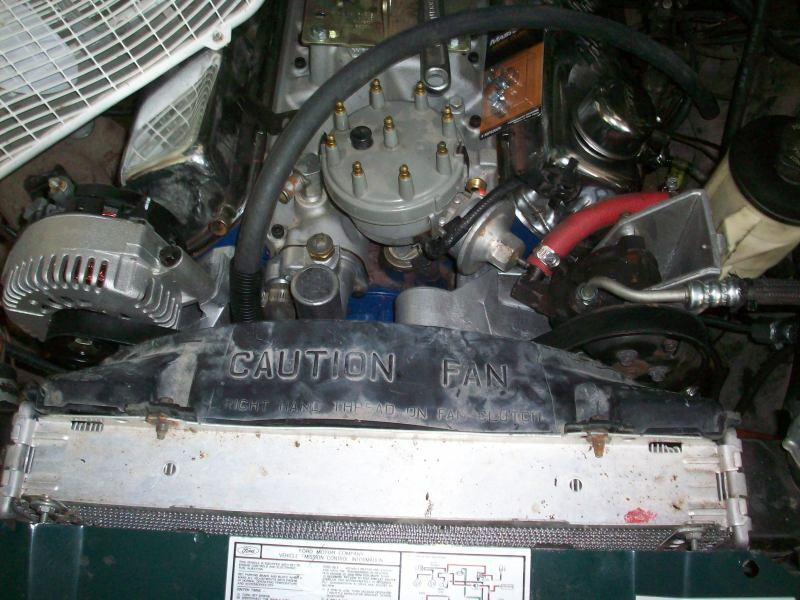 My ‘85 does not have A/C so I just used a shorter belt and left the compressor in the JY. It looks to have enough room for a compressor, if someone else pipes up about how that would work out on a TTB truck it would be great. I went farther into my engine than just the FEAD so ignore parts of pics with valve covers, heads and intake off, you do not have to do anything with them for this swap. 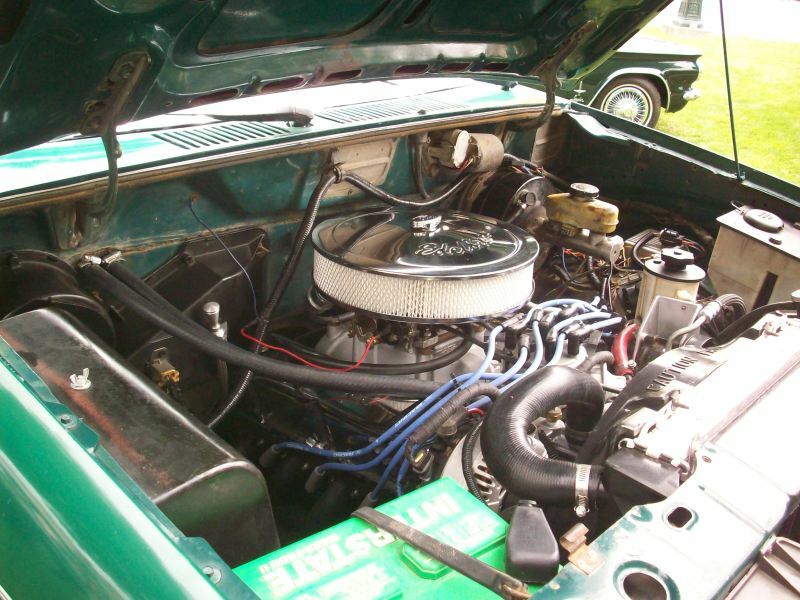 Remove everything on the front of your engine down to the block; fan, radiator, all the accessories and brackets, water pump, timing cover and harmonic balancer all have to come out. Carefully clean the gasket surfaces and prep for reassembly. 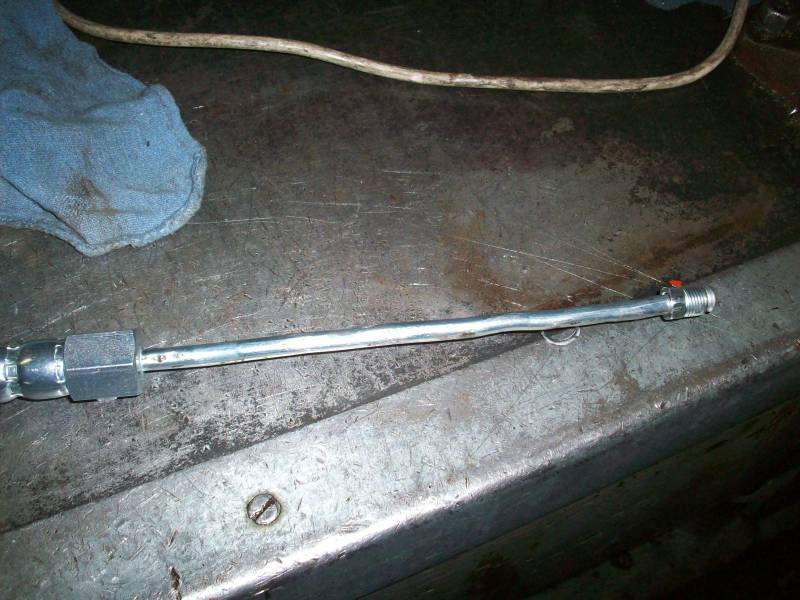 You will also need to remove the pressure power steering line from the steering gearbox. 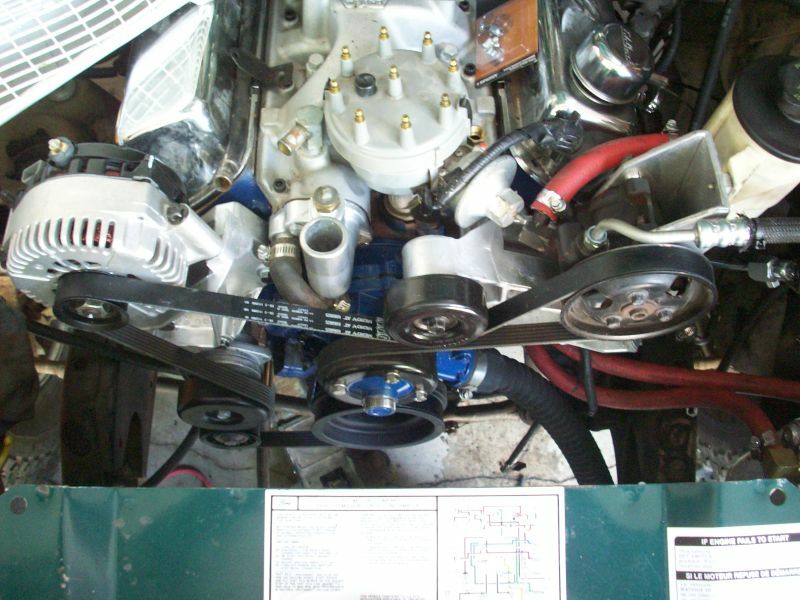 If your engine has an oil slinger/fuel pump drive on the camshaft you will have to remove it. Replace the bolt because it does serve a purpose. 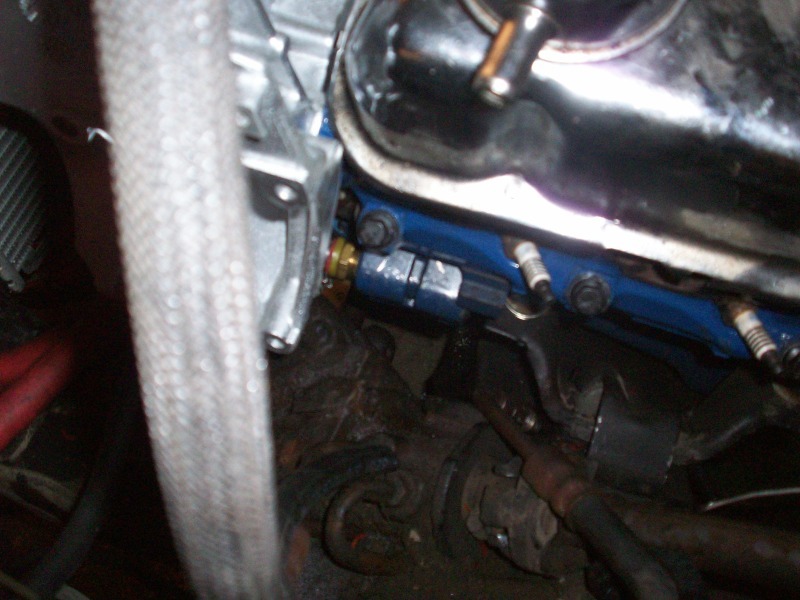 Mount the timing cover and water pump, use paste thread sealer around the four bolts that actually seal the water pump (two per water port) Don’t forget the timing pointer so you can set the timing if you are running a setup that requires setting the timing. 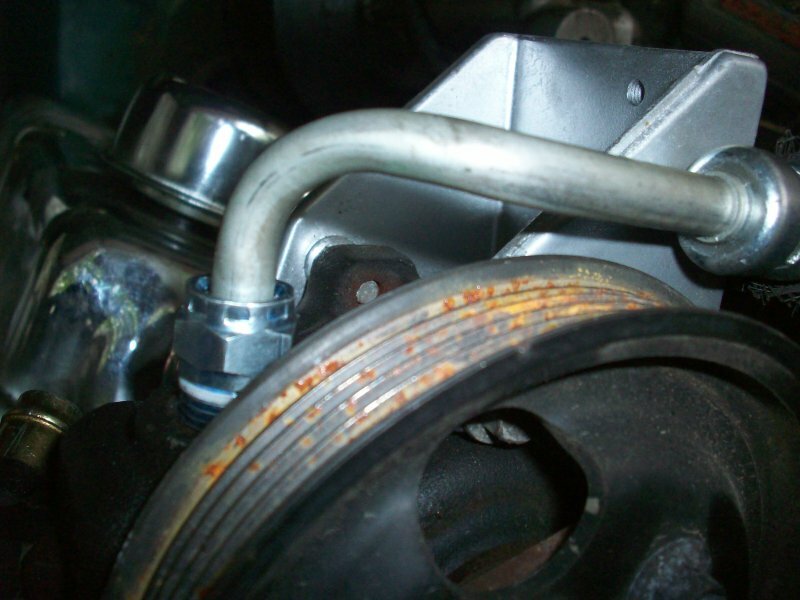 Go ahead and install the heater hose on the water pump because things will get tight later. Keep an eye for rubbage as this goes together because it will want to get a little friendly with the alternator bracket. I have some accordion type wiring loom on it and a ziptie to hold it away from the alternator. Also don’t forget to install the bypass hose and orient the clamps so they can be removed down the road without having to remove half the truck. 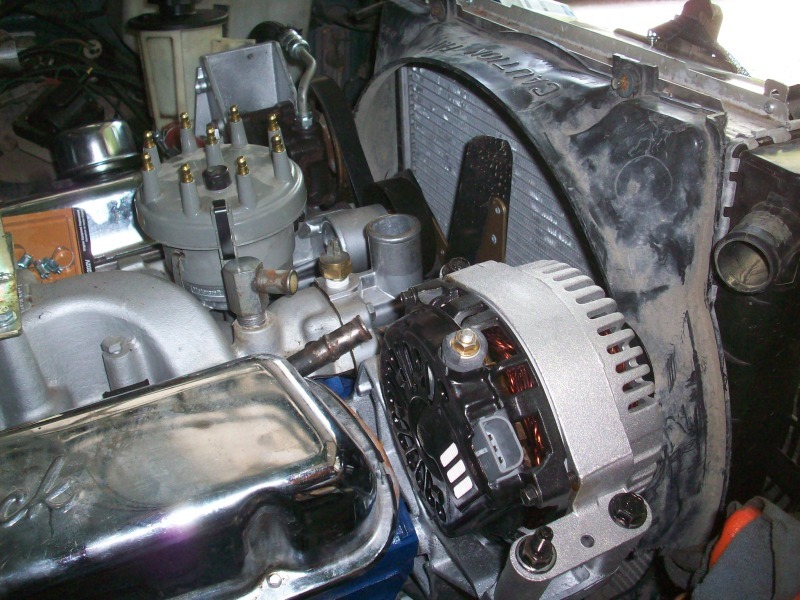 If you are going to run a fan between the engine and radiator (mechanical or electric) now is the opportune time to figure out what you are going to run. I ran the 91-94 HD Explorer radiator in the stock location with a low profile flex fan with a conversion hub and a trimmed 91-94 shroud. I also have an electric pusher for a backup, it does run if I leave the truck idling for extended periods of time. 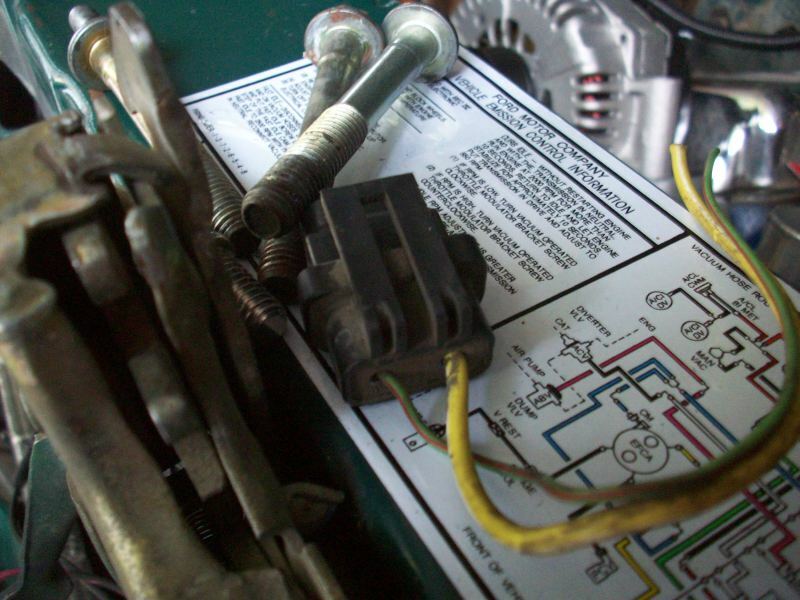 Don’t install anything for good yet but it is a great time to check clearances. Next time I would test the cooling system by just hooking the radiator to the bare long block and letting it sit for awhile to test for leaks. 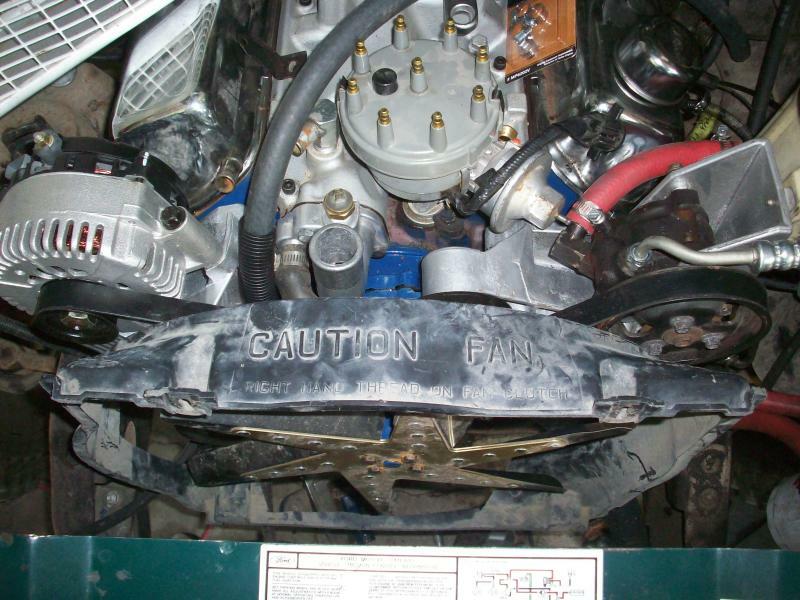 With the FEAD installed you can see very little of the timing cover and water pump. Drain the coolant and remove the radiator. 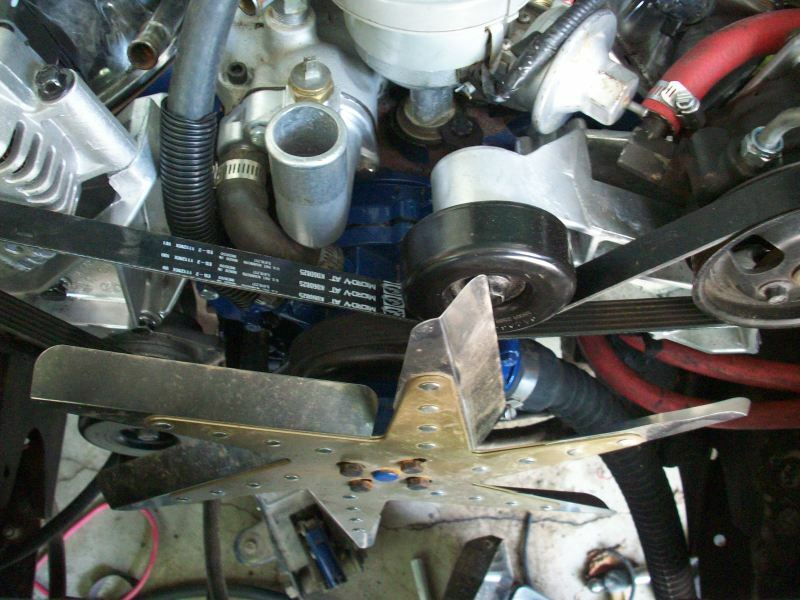 Now you can go ahead and mount the passenger side bracket with the tensioner/idler. 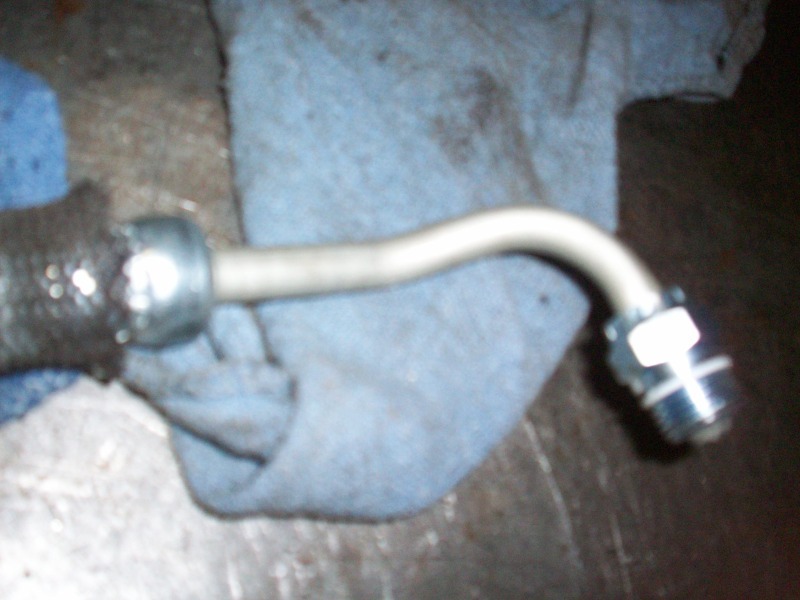 I have my oil filter relocation adaptor mounted where the charcoal canister used to be, I found the best routing for the hoses with this FEAD was straight ahead and angling off to the adaptor. After the engine is in I could not remove it (it was rectangular shaped and would hit the engine cross member) so if you don’t get it right you may have to pull the engine. 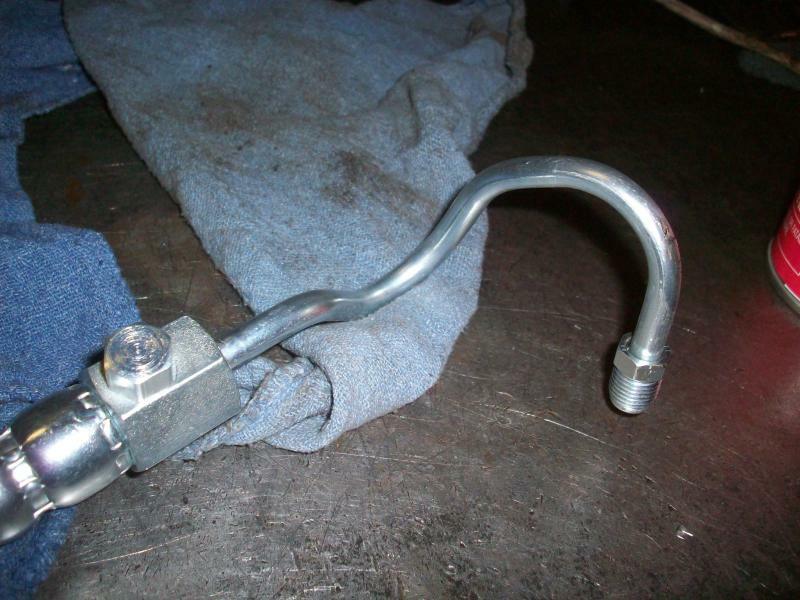 Depending on what ignition system you run the drivers side bracket may need some clearancing for your distributor. I am running a Duraspark system and by timing the dizzy one tooth and rotating the plug wires one post off I got it timed by just trimming this nub. You can trim more of boss that the idler mounts to if you have to. 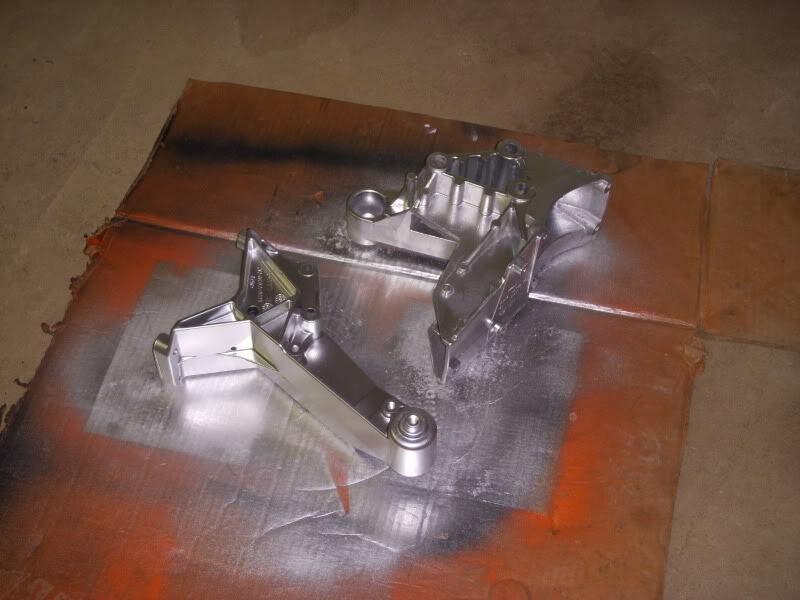 You will probably have to play with the remote hoses and ignition so there will probably be a couple dry runs before you can finally mount the drivers side bracket with its idlers. 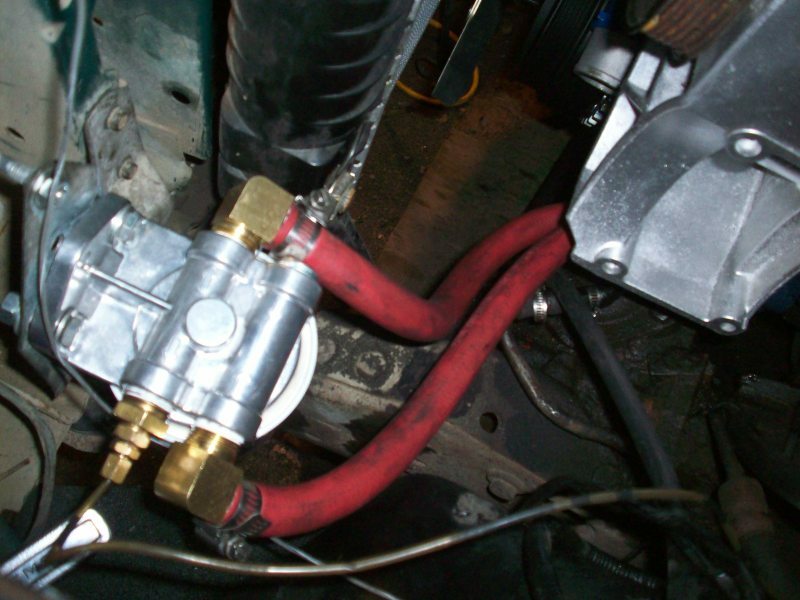 Go ahead and install the bracket and pump when you are comfortable with how everything sits. 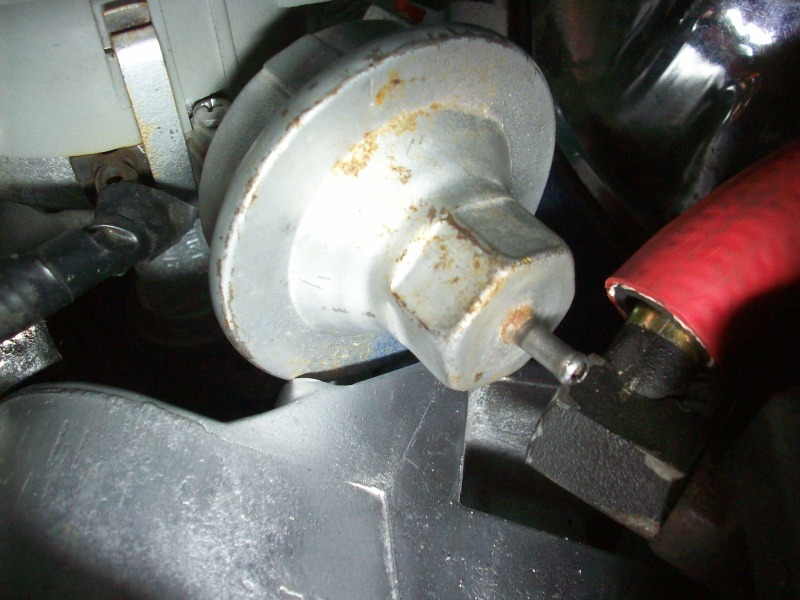 By the time they put 5.0’s in Explorers Ford had changed the fitting on both the PS pump and steering (which was also a rack and pinion in the Explorer and is way too long) This means that neither the older Ranger or Explorer pressure lines will work. However the early 4.0 Rangers have a line that has the right fitting on each end. I used one spec’d for a ‘92 Ranger with a 4.0. I carefully straightened the curly Q stuff in a vice so it would reach and it fit very nice. It will not come with the nylon sealing washer, they are cheap but nobody stocked them (or the line for that matter) so make sure to order that when you order the line. Mount the pump and install the line. 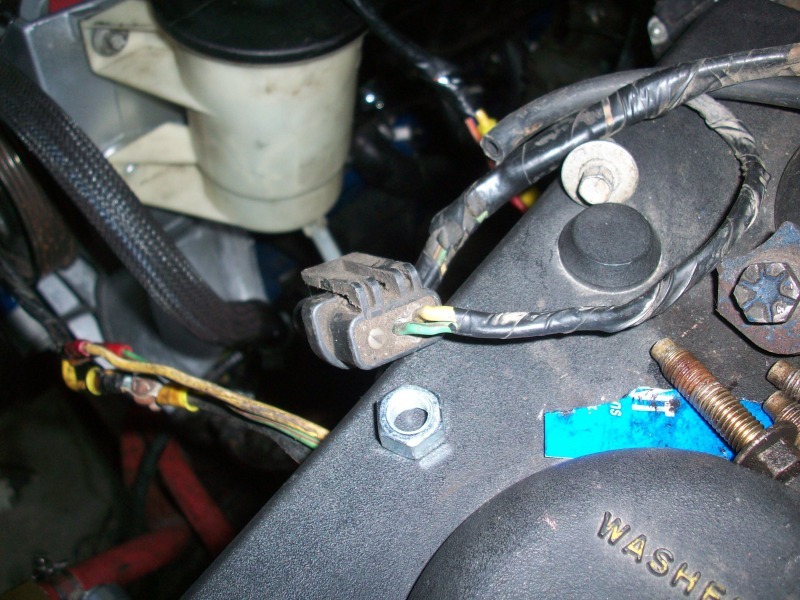 The power steering line didn’t sit quite the same as it did in an Explorer, mine sits over the PS pulley. Don’t forget to put the cap on the line unless you have to run the switch. 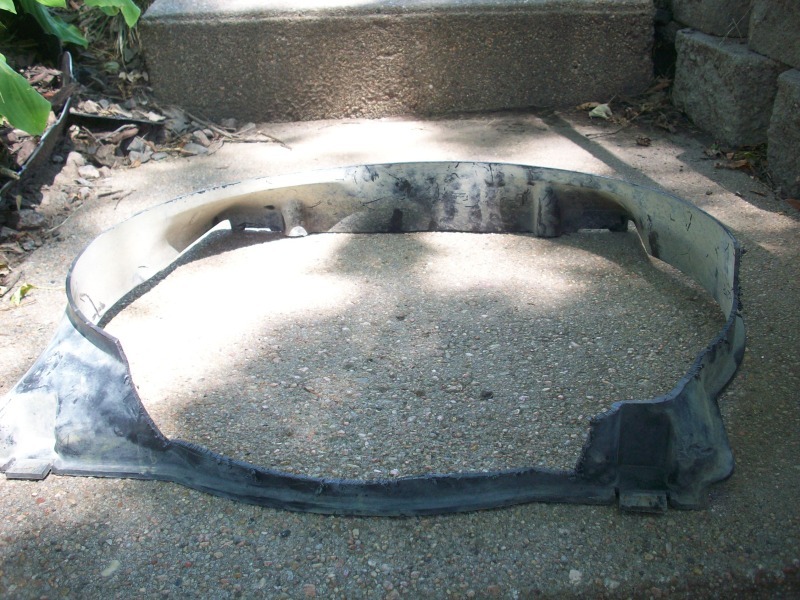 My truck has a 3″ body lift, a standard height truck may have clearance issues between the PS reservoir and the hood. Keep an eye on that, you may have to lower the reservoir. The supply line between the reservoir and pump is very pricey, $30 and is sold by the 3’ piece. 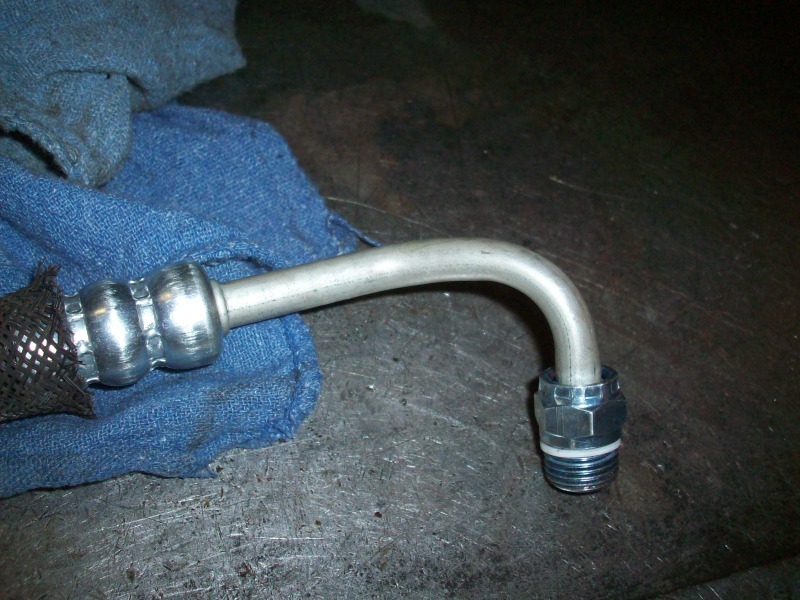 However generic oil rated 3/4″ hose will fit fine, it only calls for 6″ but you will probably have to buy a foot of it. 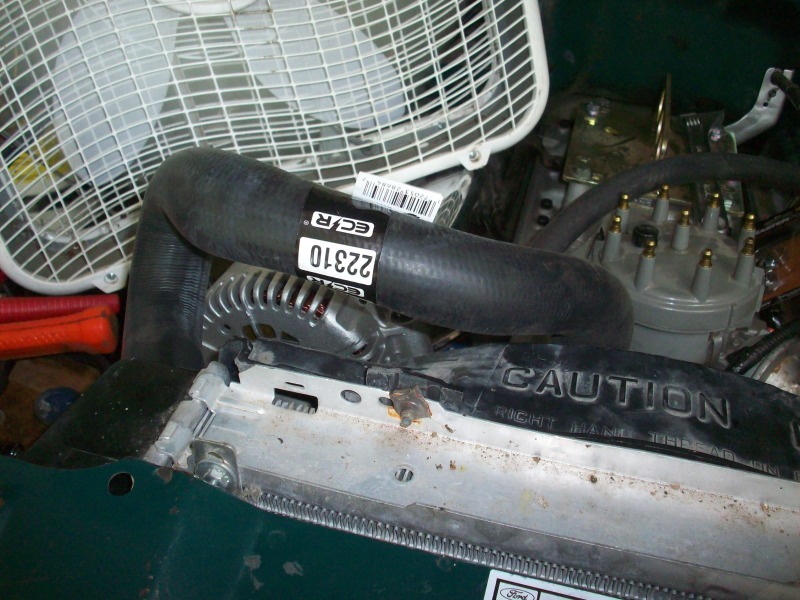 It has to be oil rated, oil will eat heater hose very quickly. Install the reservoir with the hose. 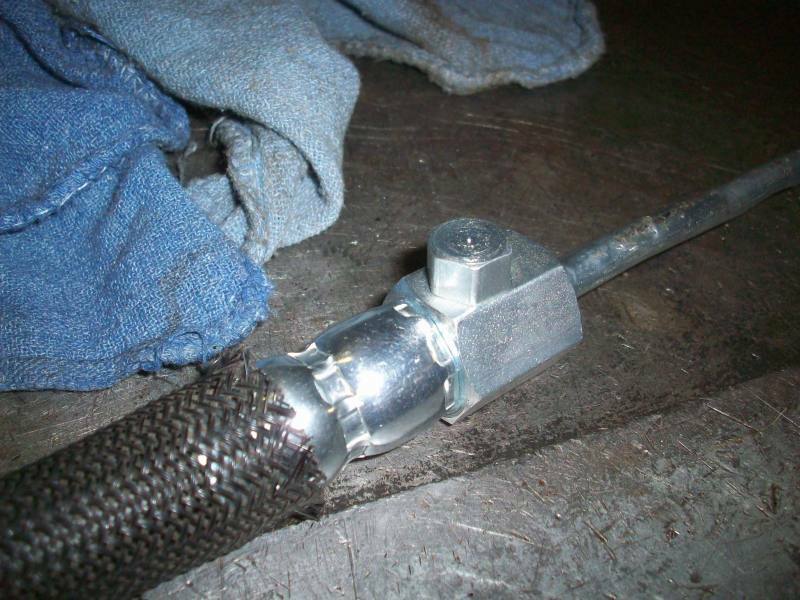 Standard 3/8″ oil rated hose with the appropriate clamps will work fine for the return line from the steering box. For some reason somebody before me had upgraded my ’85 to the later internally regulated alternator, when I went to buy replacements back in my 2.8 days I had to get one for a 2.9 truck. My Ranger’s alternator had the main power cable going directly into it where the Explorer has a stud with a post on it so that needs adapted. 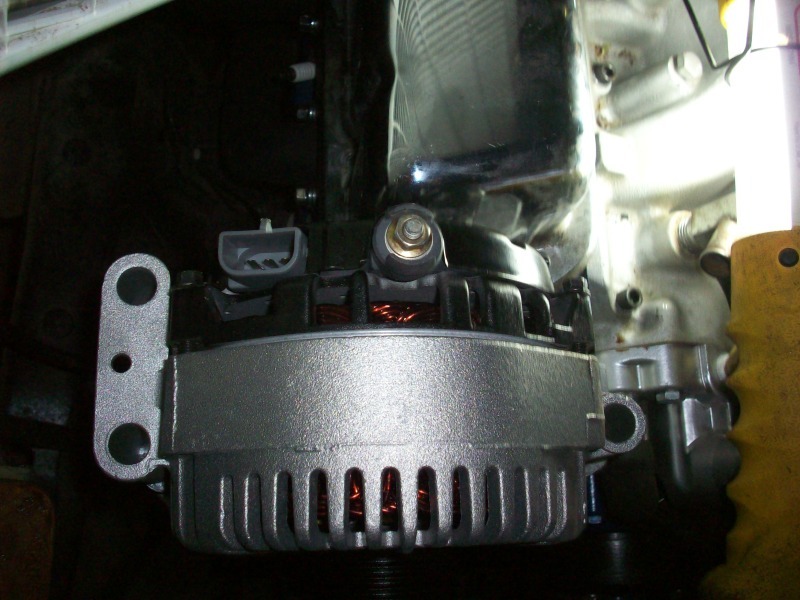 Both alternators used the same connector but they are pinned differently, out of the three positions there are only two wires and between them one wire is mixed around. Mine had questionable wiring so I just spliced in the Explorer connector and was done with it. With the all the front accessory pulleys and idlers on go ahead and put the belt on. Install your fan/shroud of choice and then set the radiator in. I used a flex hose for the bottom hose. 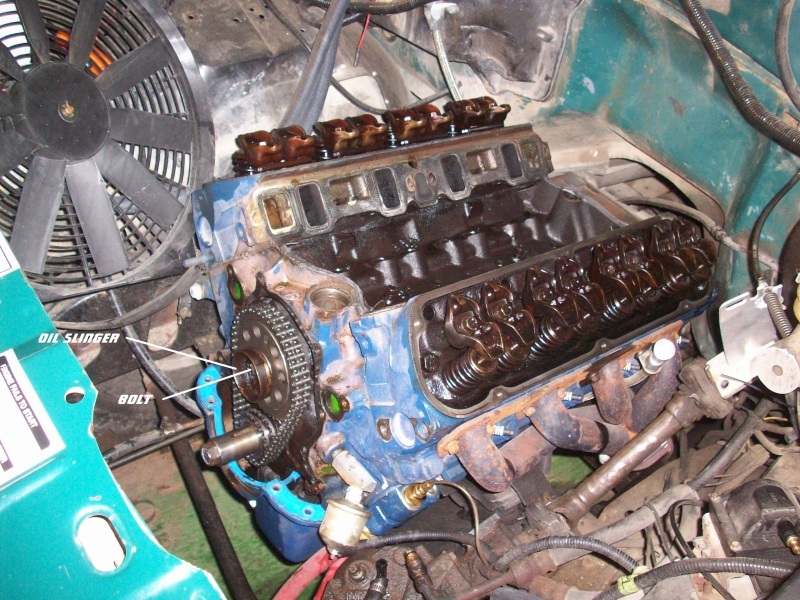 If you have the valve covers off for whatever reason you may have to pull the alternator as well depending on engine placement. I could not get my valve covers on with both the heater box or alternator in place… since the heater box has to go on first I had to remove the belt and alternator to install the valve cover. 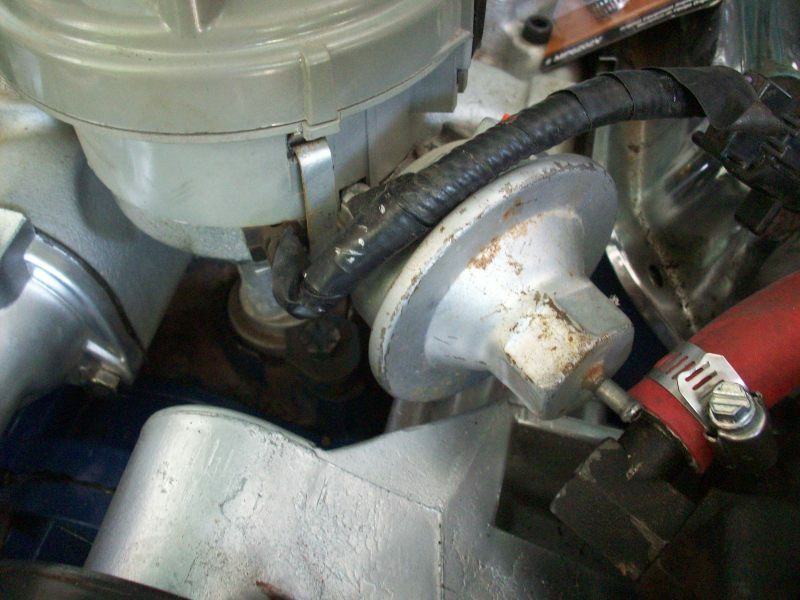 Even with the fairly tight setup with the shroud it was simple to slip the belt off and remove the alternator. And when it is all said and done you have a more compact setup that looks great.